The churchyard is looking wonderful. Our own colleagues work regularly on mowing and clear up. We need more help. The first working morning will be April 13th at 10.00 when there is also a Clean up campaign running in the area. Why we had to spend £10,000 on felling unsafe trees. 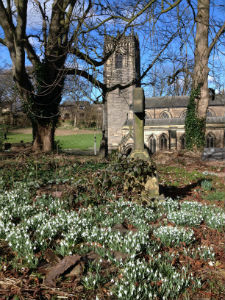 As well as being a consecrated and active burial ground the churchyard is a resource for local historians and a haven for wildlife of all sorts. 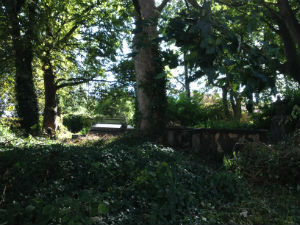 The churchyard of is a beautiful oasis situated between busy main roads in Thornhill. Covering an area of round about 3 acres it is a place of solitude and peace for the relatives of the departed. 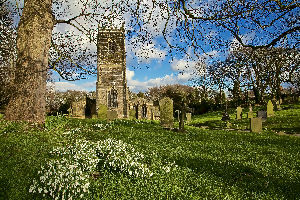 The churchyard is visited by many people tending graves or cremated remains plots and also by people passing through on a leisurely walk. 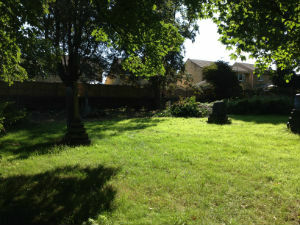 Some parts of the churchyard round the edges and where wild flowers are encouraged to grow are left to grow a bit wild. These wild areas are home to a huge selection of butterflies, birds, hedgehogs, frogs and other wildlife ( see study by Marjorie Middleton click on sub page ). 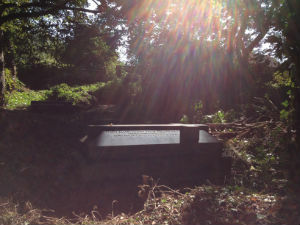 Layout of sections in the Churchyard- this should help you find a particular grave. Rectory Park -across the road from the churchyard is the wonderful Thornhill Rectory Park which was once the home of the Rectors of Thornhill. There has always been a close contact with the park and the church. The Friends of Rectory Park (click here ) have a new website .There are some wonderful pictures to look at here. There is a super picture too of the spitfire which came to our Summer Fair.